ZION NATIONAL PARK — Southwestern Utah’s top tourist destination, Zion National Park, has reached the next step in its current Visitor Use Management Plan effort to address the crushing increase in visitation it has experienced the last 10 years, proposing an online reservation system as part of the solution. The current stage seeks visitor comments on three “preliminary alternative concepts” aimed at improving the visitor experience while exacting less damage on the resources the park is tasked to protect. “The alternative concepts were developed from public comments, National Park Service staff input, and other information gathered for this purpose, which include the Park’s enabling legislation and the desired conditions identified in previous park plans,” a recent news release stated. Alternative A would allow park management to focus on continuation of the management direction established in the general management plan and other relevant park planning guidance. Alternative B would be establishing an online reservation system simply to enter the park itself. 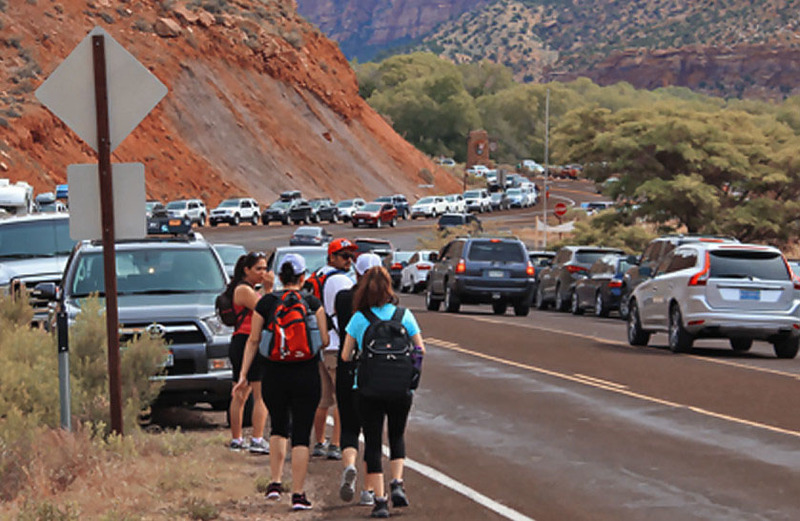 Alternative C would create an online reservation system that would be more restrictive – reservations for specific areas and trails of high traffic such as Angels Landing and the Narrows. “Visitors would only be able to visit those sites in the park for which they have obtained a reservation,” the newsletter detailing the alternative concepts states. Either approach B or C would improve the visitor experience and reduce degradation on park resources, the newsletter states, but would require visitors to proactively plan their trips to Zion far in advance, an option that doesn’t sit well for some, especially locals accustomed to spur-of-the-moment trips to the popular park. Although park staff would continue to take action to address resource impacts and manage for a quality visitor experience, management would continue to be reactionary, responding as needed, from place to place and situation to situation. No new holistic, systematic park-wide approach to managing increasing visitor use levels would occur under this alternative. While it seems counterintuitive to even mention maintaining the status quo as an option, Zion National Park Public Information Officer John Marciano said, there is a clear reason for it. In his formal letter at the beginning of the newsletter describing the alternatives, the park’s Superintendent Jeff Bradybaugh is clear about the need for strategies to rectify the park’s current overcrowding. More than 2.1 million visitors have been counted in the park through June this year, which represents an approximate 10 percent increase in the record-setting 4.3 million-visitor year the park experienced in 2016. To put the visitor growth into perspective, the shuttle system, which transports visitors up the 6.5-mile Zion Canyon Scenic Drive during peak visitation times (which continue to lengthen), was designed for 2 million to 2.5 million annual visitors – about what the park experienced when the shuttle was implemented in 2000. Even to get on the shuttles, visitors often stand in lines that last 45 minutes to 1.5 hours. 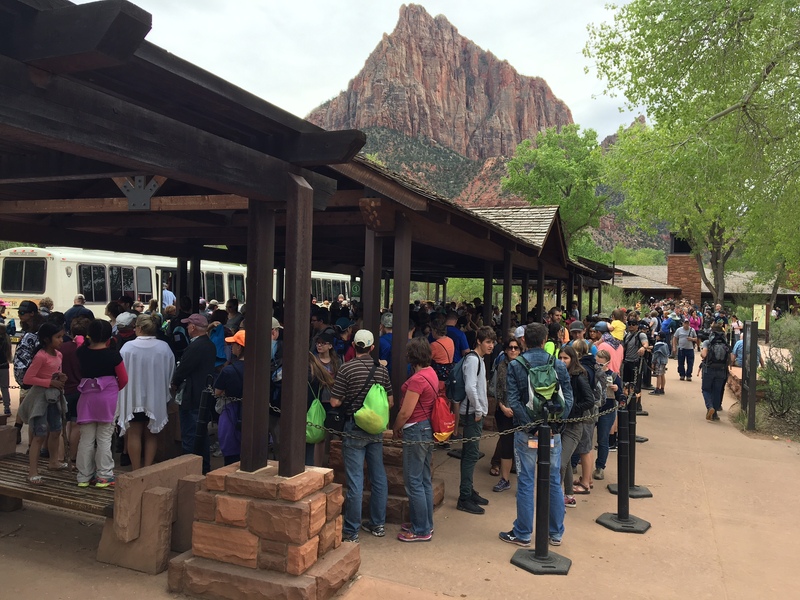 Besides the shuttle, the newsletter states, other negative effects of overcrowding include an exponential increase in emergency incidents and the creation of 30 miles of visitor-created trails just in Zion Canyon itself. The park has been collecting data to determine its carrying capacities, which has been one of the main goals of the Visitor Use Management Plan. Those carrying capacities will help park service officials determine the amount of people to allow if a reservation system is chosen as the preferred alternative. Adding more shuttles has been determined a nonviable option; as previously explained, the shuttles are already overcapacity. Increasing entrance fees during peak visitation times during the day has been rejected; this would essentially turn away less-fortunate visitors and go against the National Park Service’s mandate to allow access to all Americans. Closing portions of the park when carrying capacity is reached was considered and rejected; such an option could cause significant traffic congestion that would have a ripple effect in the park’s gateway town of Springdale. 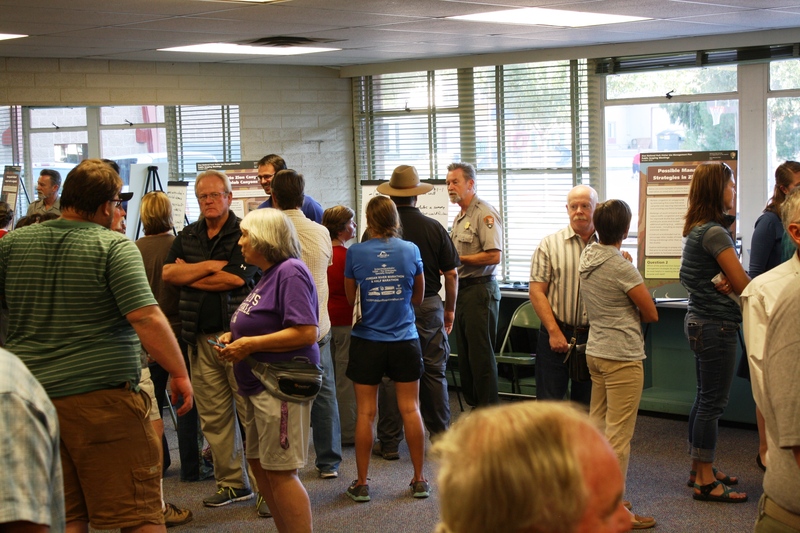 Timed entry, preference to specific user groups, discontinuation of the shuttle and closure of Zion Canyon to all vehicles and construction of expanded visitor facilities were also options considered and dismissed as nonviable solutions. Many people may not realize how complex an undertaking this is. There are many complicated, time-consuming facets of coming up with what we hope will be the right plan. We (are) studying parking issues inside and out of the park. Even while the visitor use management planning effort goes on, the park is not idle and is making adjustments that have helped manage the overcapacity; among those, increasing shuttle service, adding more parking and even providing more port-a-potties. These efforts are an informal visitor use management plan, Maricano said, while the formal one is being developed. Marciano is optimistic that the park will receive more comments during this phase of the planning process than during previous stages because the park has now presented tangible alternatives visitors can consider. The news release that accompanied the newsletter echoed Bradybaugh’s sentiment. The comment period on the alternative concepts is now open through Aug. 14. Those who would like to comment, should visit the National Park Service’s Zion Visitor Use Management Plan Preliminary Alternative Concepts webpage and follow the “Comment Now” link. The complete alternative concepts newsletter is available for download at the bottom of that same webpage. The alternatives and the analysis of the alternative comments will be presented to the public in the draft plan and environmental assessment scheduled to be released Fall 2018, the press release stated. If they use a registration website someone local could create it for $10k in a month or two and it would be intuitive and work reliably, but because it has the word “national” in it the cost will be measured in millions if not tens of millions and it will be an unusable, unreliable piece of junk (I know, I work with fcc.gov all the time and its awful). If they do have an online reservation system I hope they’ll keep a certain percentage reserved for those within a few hours of ZNP so locals can still go enjoy it without having to plan it 18 months in advance. “Paved paradise and put up a parking lot.” When you pave through beautiful wilderness areas, this tends to happen. Would recommend listening to Edward Abbey’s recommendation and let the roads in Zion die out. Let people walk in. Should trim down the crowds. Also may help if the park superintendent stopped brown nosing the local community by allowing the ridiculously low priced annual passes. If locals had to pay full price like everyone else, it would cutdown on those up there just for a “cheap” family outing and probably reduce traffic by at least a third. With all the bad press the parks been getting, there’s obviously no over oversight, or supervision at a national level. Charge foreigners extra or make them preregister online unless the foreigner is accompanied by a citizen. I have seen how many foreigners come and they’ll keep coming. As a foreigner in Peru i had to pay more than double of what Peruvians paid to go to Machu Pichu. This is normal. Online registration for everybody is not. Ask other NP what they do it’s a new problem. Also it’s a Springdale problem since a lot of revenue comes from the park and the city could bear more of the load from the park. You need a 10 year plan and a big name city architect that can turn the city around. It’s a world class problem that can not be handled by local politics. Think big picture not what you can do today. It a problem figure it out it’s not like putting a man on Mars. People all over the world and the US come there and that will not change.